Black Swiss Tropic Style Silicone Rubber Strap with Stainless Steel Buckle. 22 mm lug size by 20 mm buckle size. Buckle end is 2 3/4 inches long, the buckle itself is never part of the measured length. The tongue end is 4 3/4 long with the first hole at 1 inch and the last hole is 4 inches. 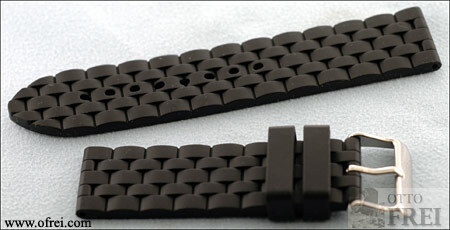 The usable length of this strap is between 3 3/4 inches to 6 3/4 inches. Total length of strap is 7 1/2 inches. Black Swiss Tropic Style Silicone Rubber Strap with Stainless Steel Buckle. 24 mm lug size by 22 mm buckle size. Buckle end is 2 3/4 inches long, the buckle itself is never part of the measured length. The tongue end is 4 3/4 long with the first hole at 1 inch and the last hole is 4 inches. 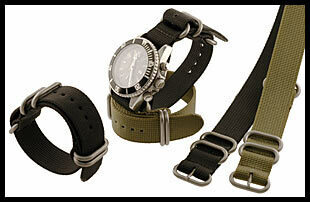 The usable length of this strap is between 3 3/4 inches to 6 3/4 inches. Total length of strap is 7 1/2 inches. Black Swiss Tropic Style #2 Silicone Rubber Strap with Stainless Steel Buckle. 20 mm lug size by 18 mm buckle size. Buckle end to Tongue is 3 inches. First hole is 2 inches and the last hole is 3 3/4 inches.Total length of strap is 7 1/2 inches. Black Swiss Tropic Style #2 Silicone Rubber Strap with Stainless Steel Buckle. 22 mm lug size by 20 mm buckle size. Buckle end to Tongue is 3 inches. First hole is 2 inches and the last hole is 3 3/4 inches.Total length of strap is 7 1/2 inches. Black Swiss Tropic Style #2 Silicone Rubber Strap with Stainless Steel Buckle. 20 mm lug size by 18 mm buckle size. Buckle end to Tongue is 3 inches. First hole is 2 inches and the last hole is 3 3/4 inches. Total length of strap is 7 1/2 inches. Black Swiss Tropic Style #2 Silicone Rubber Strap with Stainless Steel Buckle. 22 mm lug size by 20 mm buckle size. Buckle end to Tongue is 3 inches. First hole is 2 inches and the last hole is 3 3/4 inches. Total length of strap is 7 1/2 inches. Silicone Rubber Strap with Satin Finish Stainless Steel Buckle. Measures 22 mm at the lugs by 20 mm buckle. Total length of strap measures 8 inches. Silicone Rubber Strap with Satin Finish Stainless Steel Buckle. Measures 24 mm at the lugs by 22 mm buckle. Total length of strap measures 8 inches. Bracelet Link Style Silicone/Rubber Black Strap with Stainless Steel Buckle. 20 mm lug size by 20 mm buckle size. Buckle end measures 2 15/16 inches; hole end measures at 4 3/4 inches. End to first hole at 1 15/16 inches, end to last hole 3 7/8 inches. 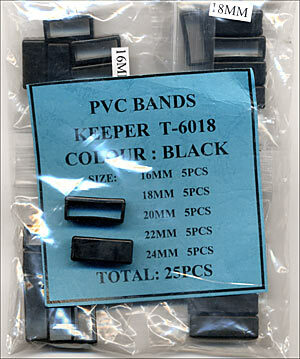 Total length of strap is 7 5/8 inches. Bracelet Link Style Silicone/Rubber Black Strap with Stainless Steel Buckle. 22 mm lug size by 22 mm buckle size. Buckle end measures 2 15/16 inches; hole end measures at 4 3/4 inches. End to first hole at 1 15/16 inches, end to last hole 3 7/8 inches. Total length of strap is 7 5/8 inches.